The way I introduce it the first time with a new class is often slightly different, but follows a similar idea. The kids come into the class and I’m looking puzzled. I explain that I found this strange piece of paper in my home last night, and I’m trying to work out what it says. I say that I’m really concerned about it and that I’d like the kids to help me. The children then look at the page and, so far EVERY time, something clicks inside them and they are fascinated, but they can’t crack the code. They guess what it might say, they accuse me of making it myself and lying about it. They ask for the translation. Then, they find the key, usually placed somewhere very obvious for them to find, and get cracking. I particularly like the activity because even though it’s perfectly possible to do this alone, students almost always work in teams. They divide the code into bits and each kid works on one section, or one calls out the symbols and the other finds them on the key. After a while, they start predicting what the message will say. They start guessing words. 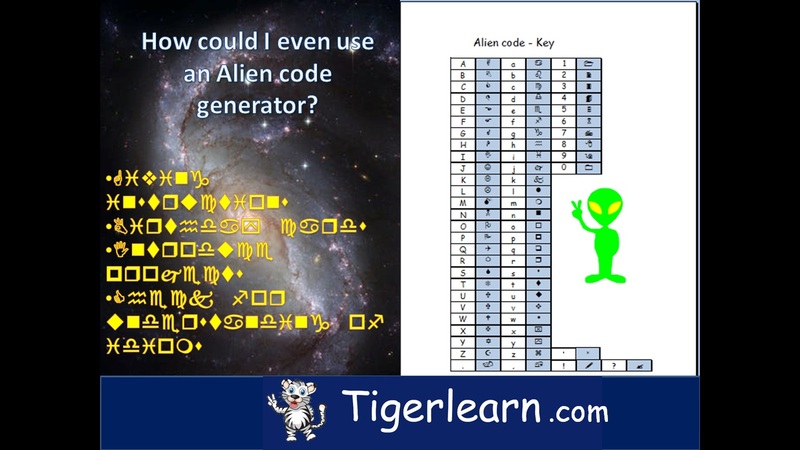 They realise there are some characters missing from the key, so they have to guess what some symbols mean (specifically, some forms of punctuation). Once complete, they read the message. When I used this as a birthday card, I quickly grabbed it back, signed it, and passed it around the class for all the kids to sign before giving it to the intended recipient. I know she took it home to show the parents. Other times, I’ve laid out the steps for the class in the message, and children have immediately moved from decoding the message to doing the task. After all, it feels like it’s part of the game! As with the green screen, it’s fair to say that not having an Alien Code Generator will not prevent your kids from learning, but it’s a great edtech tool to use in the classroom. Why not take a look at the professional development opportunities from Tigerlearn?